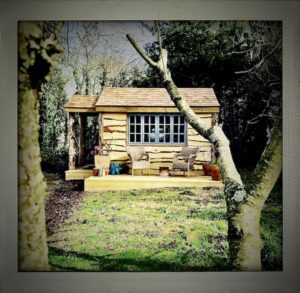 I have had a lot of writing rooms and desks in my time, from a notebook on my single bed at Combe Avenue to this wonderful cabin here in my new house in Sussex. Where ever I write I like to have me around, my school books diaries and note pads from down the years. I like to have books around me, and a guitar, just in case. I also like candles and trinkets like an old lady in a home. I once had a roll top desk to work on, that was in the Squeeze offices in Greenwich Market, I went there to work, and to nip in and out of the local pubs. The desk followed me to my cottage in the country when I first moved out of London, and then into Old House in Peasmarsh. In the late 80’s I had a desk made for me, it was designed to look like a stack of books, which it does, it was made by a local carpenter in Kent, its my home desk. It cost £600. When I had a studio in the country in one of the rooms I made myself an office, but I could not see out of the window so had a small stage built, those were the days, and the desk went up there, my view was of the house I lived in with Cissy and Grace. I could see them in the garden playing and being nippers, as they were. When the studio took off with bands coming and going I had to move out, back to the house. In sadder days when I then moved to Wapping and was a single man my desk was overlooking the river Thames, which was amazing and very inspirational, it moves with me where ever I go. Each drawer has different things in it, guitar stings, postcards, paper, dusters, and more pencils and more pens. Each drawer has a different smell, different kind of incense and pencil smells. After being in London we moved to Brighton and the desk and my shed managed to squeeze into many small flats and Mews around the town. Back up in London once again and into a Mews in Marylebone where the desk sat at my front door, with a bell on the top like a hotel check in desk. There was little room for much else. In the last 8 years the desk and me have moved to Sussex and into a huge Barn where it and me had my own space, it was a creative well, Cradle and The Knowledge written there in quiet times. The desk has embraced the creative for all the albums I have written the words for since 1986. Louise and I moved into our home four months ago, its our home, its very much our dream being, we are hugged by our tiny village and all the good people who live there. I feel lucky. Last month a small company came down to build what is my tiny cabin, a place for me to sit and write to all of my hearts content. Mark and his team have built such an amazingly inspirational space to work, its kind and it’s calm. It sits underneath the many Rooks nests in the trees around us, they make a good sound, one you can’t really avoid. In my room I have my desk and my many things that keep me in my place, the womb of creativity I hope, where words will be tossed and fried, hung up and ironed out, found and stolen. I have many projects to work on, it’s time that I now need to find to house them all. The care taken on the build was outstanding and I’m very grateful to Mark and his team for the time they took to master build this place for me. From my desk I can see the house at the end of the garden, I can see the village resting above the soon to be roses, and the beds and polly tunnel where Lou is growing our summers salad’s. Home is here. I can see the cat and the dog loitering about on the pathway, they have a on off relationship. I can hear the village simmer, gently. There is just enough room in my cabin for me the desk the books the pencils and the guitar, that’s all I need. I can’t wait to get tucked into the imagination under the Rooks nest. To build the shed, the cabin, the lair, I had too sell all of my guitars and I want to thank Val and Jac for being so kind with me, letting me use them on tour while they are now their guitars. To find such kind people as this you have to do a lot of praying, and there we are. My vicar Peter loves my cabin and says it feels kind. He knows how to pray and how to feel connected to all of the above. Everyone who has come to the build has been kind, so he is right to have that feeling. It’s like I have ended up in a Mervyn Peake story, The Boy In The Darkness. Lost inside a world of Rooks trees and woodland creatures all just outside my back door, down in the village of inclusion. My new writing den is powerful in its purpose and in time I’m sure will be part of the story that will define my life here. Amazing, a loft full of guitars can turn into a place of such beauty and grace. Thank you Mark from Tiny Cabins, please look them up. And in other news my wrist still troubles me but not as bad a few months ago, I keep finding the weakness in the shapes I can pull, last weekend a small gig and a few G 7th’s went right up my arm and into my eyes. Pain. I have been taking it easy and keeping away from the clever chords, for the time being its all about keeping it simple. I dread the op, I watched the replacement wrist videos on the internet, now is not the time though, ahead of so many shows and so many nights away from home. I realise this might not be the right thing to do but for now I have to follow what I know and keep to the clean side of the street. In my room I sit and contemplate the months ahead, the shows later in America and in the UK, and the challenges of just being in the moment so that I can express myself in a way I am used to. In my room I feel safe and in my room I feel quiet, I can see the home we have built and I can feel the atmosphere between this place and that. Now that I have this place I must learn not to isolate and not to be in the secret. Christopher has to be not under the table with the currents and cake but somewhere in between the adult and the child, although I have to say under the table suits me better sometimes.